Window heat pumps are designed for conventional cooling or heating of a room or small area of a house. They are significantly cheaper and have smaller operating costs than whole house HVAC systems while providing personalized temperature and humidity control. This article is a general buying guide that includes some of the advantages and disadvantages, selection tips, how they work, types and window mount heat pump reviews. The biggest advantage to window heat pumps is the price, often coming around few hundred dollars for smaller ones. The window heat pump is small and easy to install, something that can be done in an afternoon providing comfortable indoor climate fast. The window-mount units are the perfect choice for renters, as any drilling or other permanent mounting is not allowed. Many big-box retailers such as Home Depot or Lowe’s sell heat pumps in variety sizes and brands, so they are easy to find, too. While incorporating two main functions – heating and cooling, heat pumps also filter inside air using the washable filter that is easy to maintain. Most of the new models come with the electronic touch pad and remote controller for easy and convenient operation. The advanced models are also Wi-fi compatible and include diagnostic tools, so by using the smartphone or tablet you can monitor and control its operation. Choose the heat pumps with the multi-directional and swing airflow control and fans with several speeds to increase the comfort and overall satisfaction. If you need to cool or heat more than just a room or area of your house, you should steer clear of a window unit heat pump. You will have dehumidification as part of the process, so you will either need to empty a drain pan or ensure that a unit can drain to the outside. Plus, they can be heavy, so lifting them by yourself is not a good idea. Heat pumps are usually less expensive to run but have very low efficiency during the cold weather. For regions with the freezing temperatures it is recommended to buy a heat pump with the electric back-up heating elements. Note that window heat pumps are different from window air conditioners. Selecting the right window heat pump is important. Depending on how big the room is, you will need to find the correct size of a heat pump. If you don’t get the right size, the room won’t be cooled or heated properly nor will the humidity be removed adequately. Stores usually have a chart with a list of what you need based on the square footage of the room. You should also look at the room itself. If the room is on the south side of the house or it otherwise receives a lot of sun exposure, you will need a heat pump with a greater capacity. Conversely, if you have a room that receives a lot of shade, you can get one unit with a smaller BTU rating. Look for the one with the best fit of BTU, EER rating, and heating/cooling capacity including the capacity of a container for air moisture removal. The most popular sizes are from 8,000 to 12,000 BTU covering rooms from 300 to 600 sq. ft.
You will also need to measure the window or wall sleeve and determine how your heat pump will be mounted, whether the filler will be to the side or above the unit, or both. It should go in a window near an outlet so it can plug in directly and not have to be plugged in using an extension cord. When you are ready to install it, have a friend help you. Air conditioners/heat pumps are heavy! In short, most of the customers select a heat pump based on the cooling and heating capacity, dehumidification capacity, Energy Star compliance, size of a unit or wall sleeve, room size and warranty. Ball bearing motors for quiet operation and a quick start. Window heat pump is different from the AC with the electric heating. It works as the air conditioner when cooling but in reverse when heating and it doesn’t heat the air directly – which is more expensive, but it moves the heat from one place to another – making it more efficient. A small thermostat on the model will keep the room at the temperature you set it. Then it turns off until the room warms back up and it needs to cut back on again. Some models can even be programmed to shut off at night automatically. You can also turn it to fan mode, too, if you just want to circulate and clean the air in the room without providing any cooling or heating. It does run cheaper since the fan is only operating. 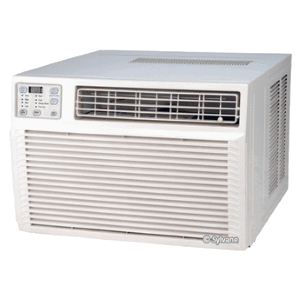 Window heat pumps are made by Frigidaire, Kenmore, LG, GE, Soleus Air, Sunpentown, Danby, Crosley, Amana, American Comfort, Carrier, Friedrich, DeLonghi, Comfort Aire and many other HVAC manufacturers. Window mounted heat pumps cost a bit more than their AC cousins up front, ranging from $500 to $1000, or more for larger units, but they are more energy efficient, so you end up saving more in the long run. Keep in mind, when choosing a window heat pump, an undersized unit will run continually without cooling the room properly, while over-sized unit will be less effective because it will cool it down fast without removing as much humidity from the air is the properly chosen one will do.